Money managed properly leads to a growth in wealth. Spending less than you save is the number one rule in wealth growth. Rule number two is organizing it and managing how it flows within your system. Learn to spend money on essentials and organize income over expense for later control. These five tips on Money Management will help anyone develop wealth. 1) Download a Budgeting APP into the phone. As money is spent or earned, keep recorded directly and instantly into the APP. This habit building activity will make any individual aware of money in and out and keep them under CAP of that budget. 2) Know your monthly average overhead to survive each month. What it cost you to live is the starting point for control over wealth growth. Once you know what it cost to live each month you can then multiple that number by 6 months and that is your minimum need for a Safety-Net. 3) Any money over your Safety-net can now be organized into your 3 Needs of Purpose; Security, Growth, and Dream accounts. Security is last minute money that can be touched when you are broke. Growth is allocated money for investments. And Dream is for those big things you want, like a vacation, or a nice new guitar! 4) To determine how much money can go into your 3 Needs of Purpose use the rule “60/40 Split”. 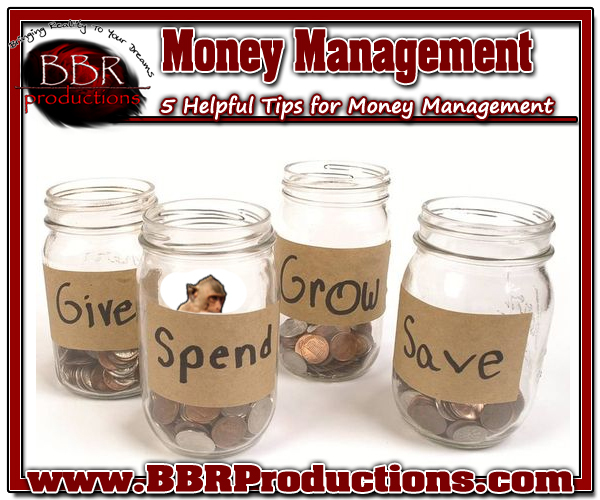 Any money over your 6 month overhead is split 60/40 and then the 60% is divided evenly into your 3 Needs. (Example: if you have $100 dollars over your overhead, then $60 can go into your 3 Needs evenly and the other $40 you can use for whatever you want. You earned it! I normally place it right back into my Safety-net. 5) Research future investments while you are saving up your 3 Needs of Purpose. Learn the system and how money works. Don’t wait till you have the money. Learn while saving. Build your tools to become aware of investment opportunities and learn the difference between a liability and an asset. This entry was posted in 3 Needs of Longevity, Management and tagged 3 Needs of Longevity, 5 Helpful Tips, BBR Productions Inc., Money Management, Thomas J. Bellezza. Bookmark the permalink.